Life. It Must Surprise Itself. | . . : : CHENCENTER BLOG : : . . I apologize for the absence of posts but the “holiday crunch” is upon me and other things have taken precedence. Though it’s a hurried time for many, including myself, it hasn’t shackled my brain in the least. I’ve more ideas, topics and projects than I can possibly produce at the moment. Therefore I’ll unveil them steadily, one at a time. So, be sure to glance back from time-to-time as I will surely make it interesting. For example, I just might have stumbled on a cure for back pain (of a muscular nature). 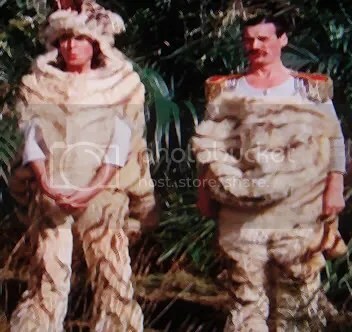 I would venture to guess that no one, upon reading this title, would have expected to see two grown men dressed in a tiger suit (Eric Idle & Michael Palin of Monty Python)? Surely you would have expected a deeply, philosophical look into one or more aspects of life… portrayed in a serious straight-forward tone… as in “This is how it is”! But of course this is not me. I don’t mean this in terms of a “there’s-no-point-to-it-all” attitude. Because there is always “a point” (as in meaning), but the meaning wanders.. and therefore the “point” never remains fixed. This is because Life is constantly changing around us, and never, ever, “settles.” Life’s meaning [in my opinion] is precisely “that” which we give meaning to [if anything at all]. But since it never settles…That may be why it is so difficult to grab. But everyone is grabbing, SEE! They grab at it through their relationships, their jobs and their churches (among other things) and still people can’t seem to find it. “Life is a joke” is a sarcastic sounding statement, but might just be the closest statement to the truth. Why must people seek anything? Why must we go to a guru, minister or councillor? What is it that you’re seeking to find? Might it be that you plan, as Alan Watts would put it, “To get ‘One-Up’ on the world. ?” And as hard as we try, don’t we always find ourselves a little behind? Might this be because we are asking a silly, non-sensical question [that being, “How might I get ahead of the game?”]. Life [to the individual], like it or not, is a grab-bag of emotions(/feelings/sensations), experiences and memories. You hit the game-winning goal, you bite into a glazed doughnut, or “pop the question” to your lady… They all are [in varying degrees] different, but nonetheless “unexpected” experiences that produce within your very core a radiating happiness. And it is our nature to welcome, with every fiber of our being, Happiness. But why do many people claim to not be able to find IT (“happiness”)? ~ by chencenter on November 23, 2008. Life is like water. Water is powerful, yet relaxing. Destructive and soothing all in the same. We can choose to go where the water takes us, and find the best there, or spend time fighting the current to get where we think we need to be. If we go with the current we will be where we are to be. I like your view, and “life is a joke” attitude. People have asked me at times in my life if “is life all one big joke to you?” Yep, pretty much… I laugh more than the average bear…I cry to…life is finding balance…like you say…the point is not fixed, and we must adjust and keep our balance. Balance is very important in your art, and art imitates life? So everyone find your balance, and stay there!!! Good blog. True too many people head to others to find the way to be happy or find meaning when they just need to wake up and see the meaning is in everything and happyness just Seems far because of the way of thinking. I tend not too think about life as an entity at all. I just enjoy myself, help others enjoy themselves and try not too damage anyone in the process. I’m not a very driven person as I tend to just kick back, relax and watch the world go by. One might even say I’m lazy. @Richard: That’s in-line with the most zen of monks. because the closer you get to buddha-hood… the more ordinary you become, the more you are like everyone else. But i don’t mean ordinary in a bad way. The taoist would put it as the sage that walks as everyone else walks…but carries the precious jewel in his heart. From what I know of ya… You’re doing just swell, my friend! Stay in your happiness.